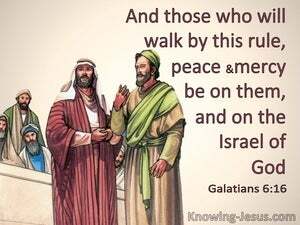 ﻿ Galatians 6:16 And those who will walk by this rule, peace and mercy be upon them, and upon the Israel of God. May peace be on all those who follow this standard, and mercy also be on the Israel of God! Now may peace be on all those who live by this principle, and may mercy be on the Israel of God. And as many as will march by this standard, peace upon them, and mercy, and upon the Israel of God. Peace and mercy be upon all who walk by this rule [who discipline themselves and regulate their lives by this principle], even upon the [true] Israel of God! 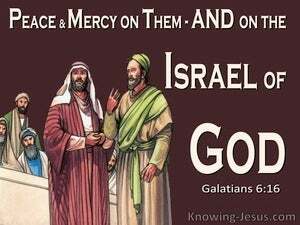 To all those people who live by this rule, may there be peace and mercy [from God] in their lives; that is, upon [those people who are truly] God's "Israel" [i.e., the church]. And as many as walk by this rule, peace and mercy be upon them, and upon the Israel of God. And on all who are guided by this rule be peace and mercy, and on the Israel of God. 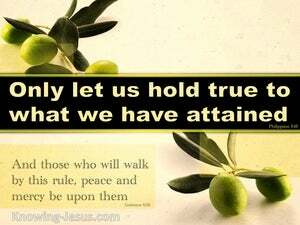 as many as walk by this rule, peace and mercy be on them, even upon the Israel of God. And as many as shall walk by this rule, peace upon them and mercy, and upon the Israel of God. And so many as shall walk by this rule, peace and mercy be unto them, and unto the Israel of God. Peace and mercy be on all who will follow this rule, and on the true Israel of God. And as many as walk by this rule, peace be upon them and mercy, and upon the Israel of God. And as many as walk according to this rule, peace be on them and mercy, and upon the Israel of God. And as many as walk by this model, place upon them, and mercy, and upon the Israel of God. And all those who follow this rule, peace and mercy [be] on them and on the Israel of God. And as many as walk according to this rule, peace and mercy be upon them and upon the Israel of God. And as many as walk according to this rule, peace be on them, and mercy, and upon Israel that pertaineth to God. On all who will be guided by this rule, may peace and mercy rest, even upon the Israel of God. On all who will govern their lives by this rule and on the Israel of God may peace and mercy rest. And all who will behave in accordance with this rule, peace and mercy be on them, and on the Israel of God. As many as walk by this rule, peace and mercy be on them, and on God's Israel. And as many as walk by this rule, peace be upon them, and mercy, and upon the Israel of God. And whoever walk by this rule, peace and mercy be on them, and on the Israel of God. And, as many as, by this rule, shall walk, peace be upon them, and mercy, and upon the Israel of God. And as many as shall walk after this rule, peace be upon them, and mercy, and upon the Israel of God. May all who rule their conduct by this principle find peace and mercy--they who are the Israel of God. And all who shall regulate their lives by this principle--may peace and mercy be given to them--and to the true Israel of God. Now peace and mercy be on all who walk by this rule; that is, on the true Israel of God. And as many as shall walk according to this rule, peace and mercy be on them, even upon all the Israel of God. and as many as by this rule do walk -- peace upon them, and kindness, and on the Israel of God! 15 For neither is circumcision anything, nor uncircumcision, but a new creation. 16 And those who will walk by this rule, peace and mercy be upon them, and upon the Israel of God. 17 From now on let no one cause trouble for me, for I bear on my body the brand-marks of Jesus. Then the Spirit came upon Amasai, who was the chief of the thirty, and he said, "We are yours, O David, And with you, O son of Jesse! Peace, peace to you, And peace to him who helps you; Indeed, your God helps you!" Then David received them and made them captains of the band. Do good, O LORD, to those who are good And to those who are upright in their hearts.